Greetings and so forth from Ulaan Baatar! I’ve just had a day of seeing the sights as it were, and finally have enough free time to blog about stuff I’ve been doing. For now, I want to take you back to Friday. 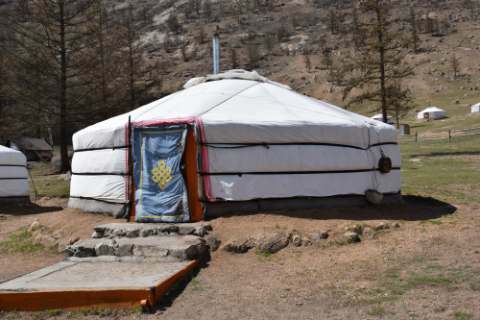 My second day in Mongolia, I decided to take a tour to Terelj. Terelj is a village in a beautiful spot, where toursits often go. Especially if like me you have limited time and want to see a bit of rural Mongolia. 80km northeast of Ulaan Baatar, there are many day trips run to this spot. 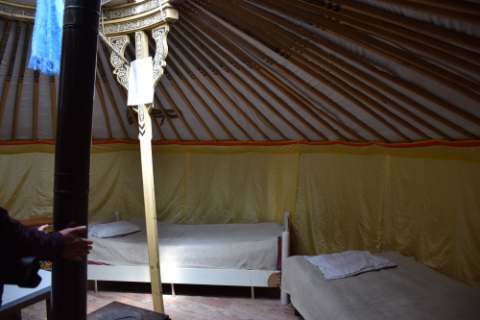 Also, on my bucket list for this trip was to spend a night in a yurt, a round tent famous through these parts stretching down to Central Asia. Except, in Mongolia, it’s actually called a ‘ger’. 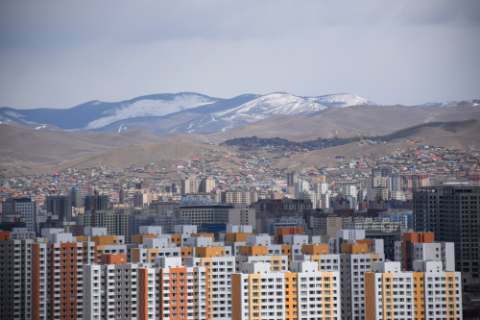 It was easy to arrange to stay there overnight and catch the one bus a day back to Ulaan Baatar. 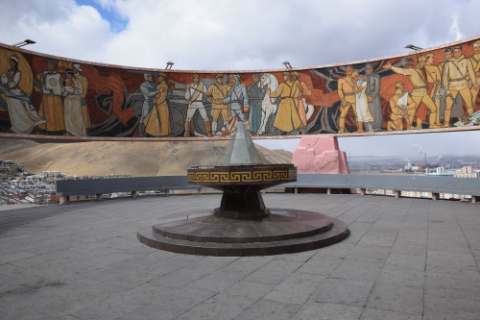 First stop was at Zaisal Park, still in UB, for a climb to a Soviet Era statue and great views of the city. 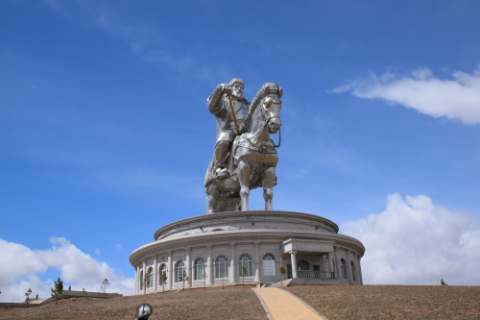 The next main stop was at this 40 metre statue of Genghis Khan. Yes, the most famous warlord of all is the national hero here, and there is more than the occasional statue to the man. This one though is seemingly in the middle of nowhere, and has a very small museum in the impressive building at the base. Then you climb up and come out on the horse’s head and look back at the Khan’s face. This was made all the more surreal by the light snow that was falling. In fact the whole day was freezing, the occasional flurry, and strong winds. 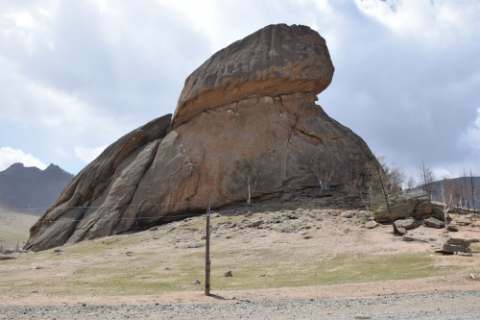 We made our way to Terelj and were greeted by ‘Turtle Rock’, and yes it does look like a turtle. A little bit. From the right angle. Then we had lunch, a hearty meat soup and buuz, the steam-fried dumplings which seems to be the main national dish. They are delicious but also are full of greasy fat. Which is probably why they taste so good. 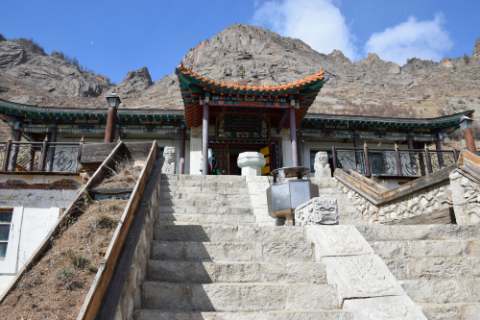 After that we were driven to the Aryapala Monastery and climbed a bit of the way to get there. But it was very interesting, and of course Buddhism is officially the national religion although I am told there’s still a lot of use of Shamanism. My tour group was small, two including myself, three including the driver. I was dropped at my ger for the night. I wanted to go for a walk but the wind and the temperature of barely above zero keep me in my ger. Dinner was served there, as was breakfast the next day. The fire was stoked in early evening and it must have been 35 degrees plus Celcius inside. I had to open the door! Everywhere here it’s hot inside. The next day my host father popped me on the bus back to UB. It was much warmer outside, maybe 15 degrees there which was a huge jump from around 2. Back to Ulaan Bataar and more to see and do. For that, you’ll have to come back tomorrow! May the Journey Never End! I’m so envious that you are there! I wish you had time to go west onto the steppe and sleep for many nights in the gers under the stars, but I know you are powering through on a longer trip. I’ll be curious to hear what you thought about UB. Inspiring stuff. I’d love to go to Mongolia! Although that city skyline looks a bit brutal! !